Father Christmas does not live in the North Pole, he moved many years ago for reasons that I will let him explain to you if you are ever lucky enough to meet him. Now he lives in Korvatunturi, Lapland, or Ear Mountain in English. 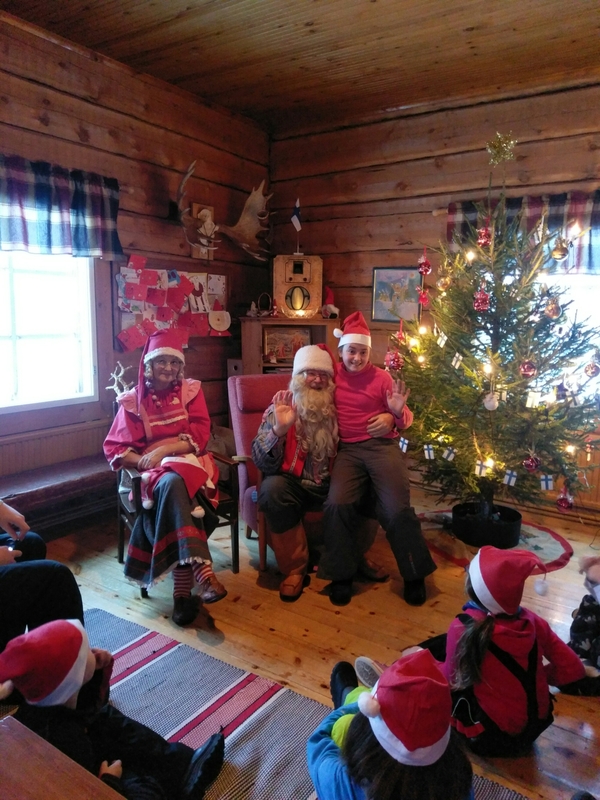 Ear mountain is a big secret and noone can go there, except the elves of course, so Santa has a few other houses in Northern Finland where he arranges to meet children (and adults) who want to see him. It was one of those houses that we had the good fortune to visit. 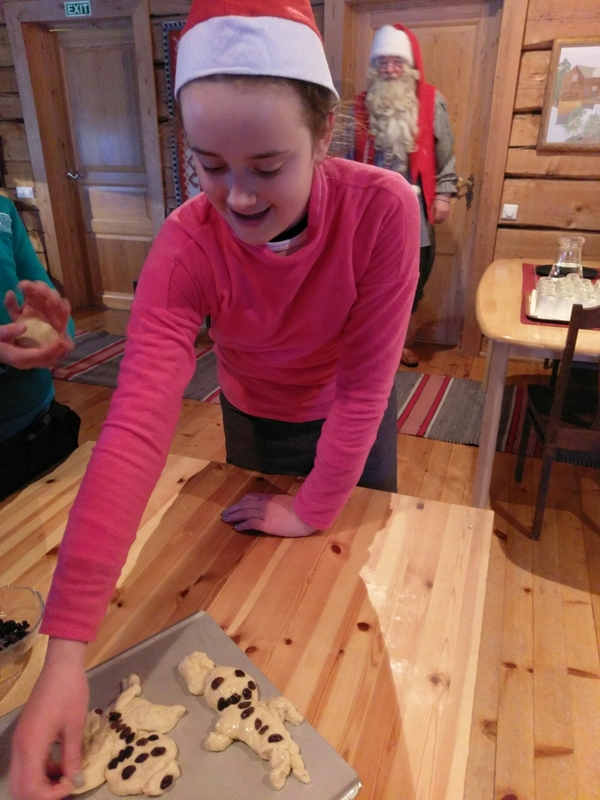 We were picked up from Ruka Village by coach and taken on a 30 minute journey to Vuotunki village, which is located in Eastern Kuusamo, very close to the Russian border. On arrival we were greeted by two playful elves who took us to some snow covered slopes and introduced us to a big pile of sledges. 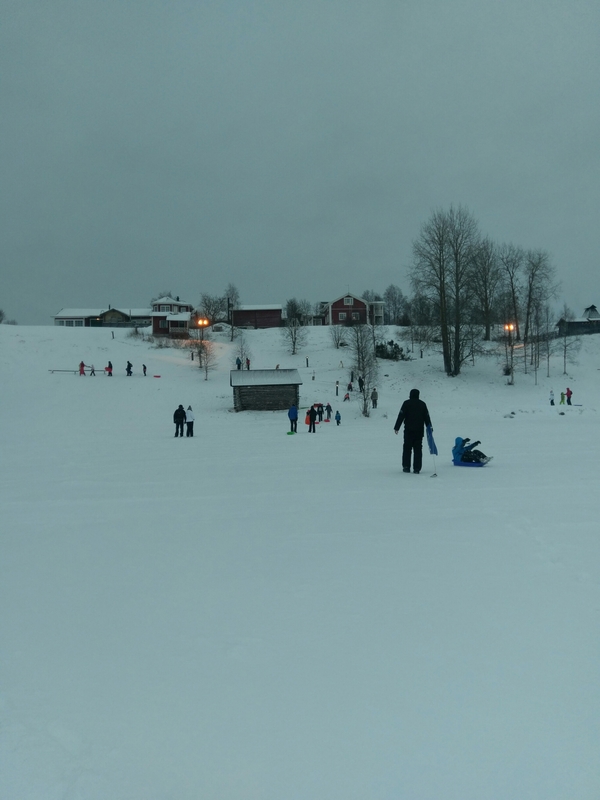 Everyone was invited to take a sledge and ride down the two slopes. 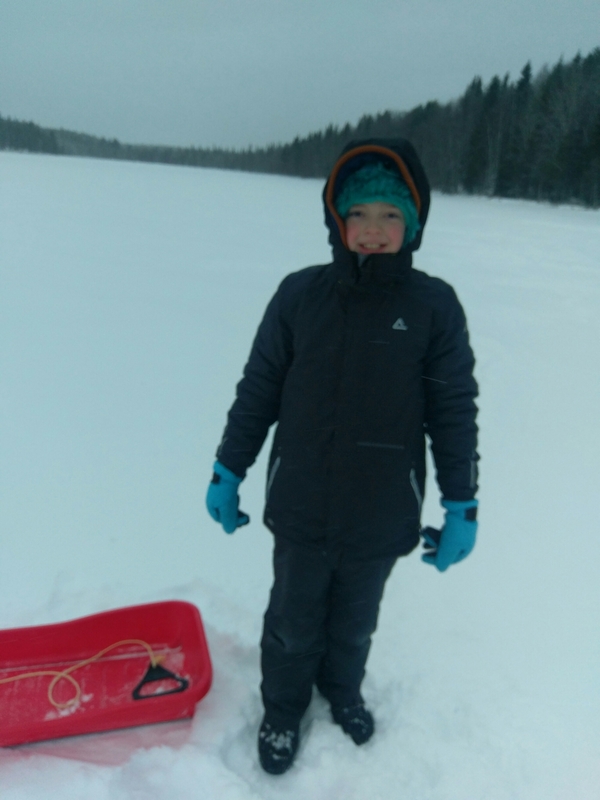 After a few turns a bell rang and we had to put the sledges away and make our way to a hut where sausages were cooking on the fire. We were served hot juice and sausages by more friendly elves. Another bell rang and we were invited into Santas cottage to meet the man himself. This was not one of those rushed, sit by santa for a photo, get a present and leave again experiences. We had a good few hours there. First, all the children were invited to sit on the floor and the adults on chairs around the room. Father Christmas and his wife spent a long time talking to the children and telling them stories before giving them all an elf hat each. Children had the opportunity to ask any questions they wanted and got very detailed answers. Following this, we were invited for a time of baking with Mrs Claus and the elves. 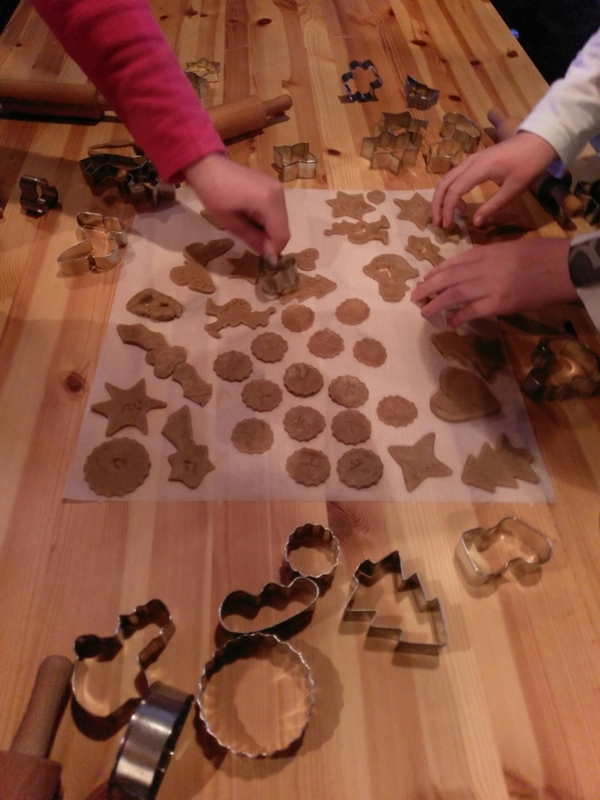 The children stood round a big table and made ginger bread cookies and spice buns. Santa Claus was wandering around talking to people and posing for pictures with families. 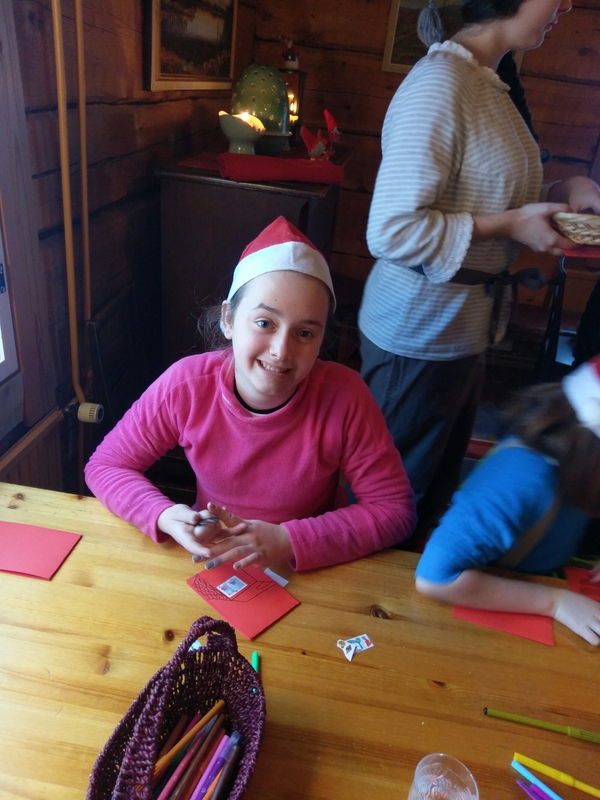 As the spice buns were cooking, the children were given a christmas card to decorate which they could take to Santa to sign. With all the activities over, we were given hot glog, tea, coffee, biscuits and chocolates. A small “post office” was opened incase you wanted to send your cards. It cost €0.50 for an envelope and €1.50 for a stamp. Other gifts were available to buy. This was in a separate room, so wasn’t forced upon you. 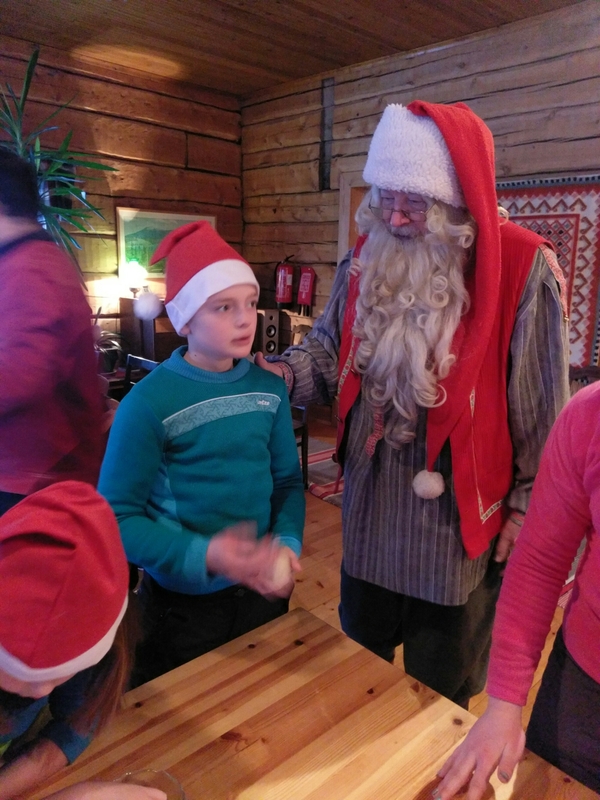 Everyone gathered back together to learn a traditional Lappish christmas song and then each child was called up by name to receive a present from Santa. We did not feel rushed at any point whilst inside and the children could spend as much time as they wanted with Father Christmas. Fun Day with Santa with an autistic child? I would say this depends on your child. This was my sons least favourite day. He does not deal well with lots of people and needed a lot of extra support to join in with activities. It was quite peaceful in the room despite the amount of people but we went in January and the trip wasn’t full. I can imagine with 40 people this could feel more crowded. Initially he didnt want to bake but once he found out it was dough he didnt mind so much and spent a long time playing with it. Santa was very good with him and didnt push him to go to the front for a hat or to sit on his knee for a picture, instead he managed to talk to him while he was baking, so I could still have a photo. 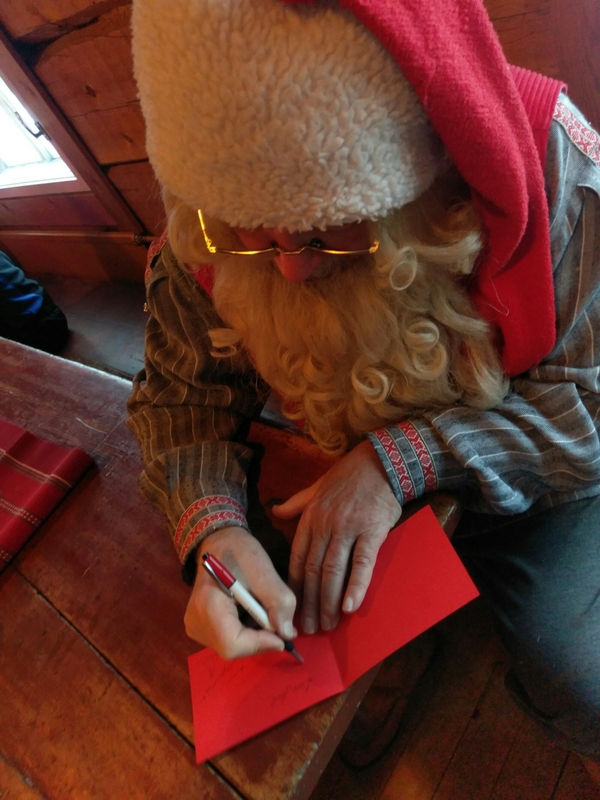 Mrs Claus was very patient with him when he was taking a lot longer to finish his baking than the other children and Santa wrote him a special message in his card because he didnt want to write it himself. He did, however, get very overstimulated and by the end of the morning was ready to leave. He ended up having a meltdown on the coach back. If your child loves Santa then I would definitely consider it. They also offer the same trip but privately and depending how many of you there are it might be worth considering. The Fun Day with Santa Program is available every Saturday from 12th Dec 2015 to 26th Mar 2016 and takes approximately 4 hours from pick up to drop off. Transfer is by coach and they take a maximum of 40 people at a time. It tends to be at its busiest in the weeks leading up to christmas. If the weather is very cold then the outside time is cut shorter. 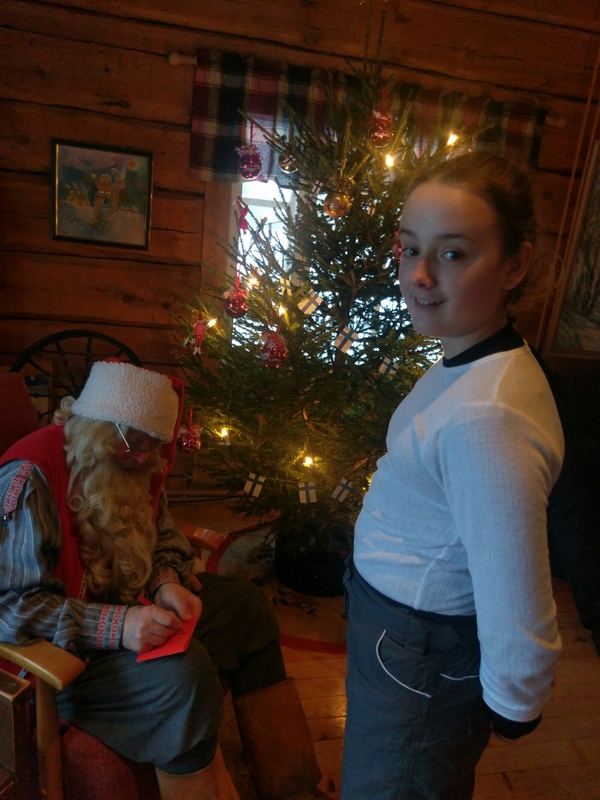 This was our most expensive activity in Lapland at €70 per person but the 9 year old absolutely had to see Santa while we were there! The price includes transport, all activities, snacks and drinks and a present for each child. Children under 2 years old can go for free and children aged 6 and under must be accompanied by a paying adult. I was in touch with Elf Tanja, who spoke very good English. If you ever get the chance, it is such an amazing place to go! This sounds like an amazing experience. Thanks for sharing it, along with your son’s response. It’s always helpful to know what may be experienced. It’s good to know he was treated with kindness and patience. It was brilliant! If I didnt believe in Santa, I do now!